Billed as "The Fastest Juggler on Earth" capturing Wally Eastwood's expertise presented unique problems. 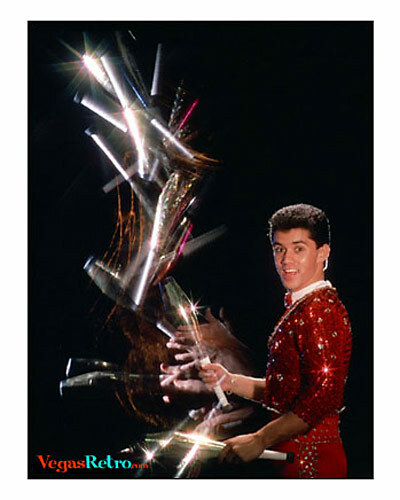 The fast juggling required a multiple strobe exposure to show the movement and a good portrait of Wally required another strobe to freeze his expression. After much collaboration, Wally skillfully juggled the pins with a black cloth over his head for the movement part of the photograph and then posed a second time without the cloth to make the total presentation. The photograph was made in the studio with several exposures on one piece of film, a true multiple exposure done long before Photoshop was invented. I saw Wally Eastwood at the Variety Show at the Aladdin. He hosted. He was amazing. And he was funny. Wally is hilarious! I saw him at the "V" Show at Planet Hollywood and he cracked me up. He is by far the best host on any Las Vegas show. He is a must see. One of the nicest guys in showbiz. He taught me how to juggle 5 balls and 4 clubs. I was impressed by his piano show, very talented. I went To Vegas on vacation ,and My family and I saw V the Ultimate Variety Show, an It Was GREAT!!!! Wally Eastwood was GREAT as well as ALL THE ACTS!!! You must see this Show if You go to Vegas!!!! LOVED IT!!! Wally you were AMAZING when I saw your show at Planet Hollywood in Vegas! I thought stole the show with your super fast juggling and extreamely funny comedy. I also would like to inform you that some haters out there are saying that your piano trick is fake. I refuse to believe that so will you please post a YouTube video showing the world it is not fake?Thanks I appreciate it Sarah. My wife and i saw the "V" show last night at Planet Hollywood,and the best part was Wally Eastwood. He is a funny and talented performer. Made my wife cry because she laughed so hard. Being hispanic probably helped her get some of the jokes. All in all would say he is worth seeing, wherever he may may be in Vegas. Also, my wife made me buys his balls, so i can practice!! Yeehaw, Go Wally. see you next time! There was another act called "David and Goliath" that appeared at Harrah's Tahoe, in the Cabaret, but it was two different guys than shown in your picture. Is it possible to get a photo of the guys from Tahoe? SORRY Richard, I only have my pictures and I have never an opportunity to shoot them.